How Should the US Deal with the Congo’s President Tshisekedi? President Félix Tshisekedi was sworn in as the new president of the Democratic Republic of the Congo (DRC) on January 24, days after the country’s Constitutional Court rejected an appeal against the results of the controversial December 30 elections. Though not free of controversy, this marks the first peaceful transfer of power in the DRC and should also mark the end of the Kabila dynasty. While originally silent about the electoral results, the US government ultimately congratulated the new Congolese government. It will be important to monitor the future of Kinshasa-Washington relations in the post-Kabila era. After many delays, the DRC held elections on December 30—they were originally supposed to occur in 2016 and most recently on December 23, 2018. According to the Independent National Election Commission, Tshisekedi received 38.5 percent of the vote, compared with Martin Fayulu’s 34.7 percent and ruling coalition candidate Emmanuel Shadary’s 23.8 percent, the BBC explains. Fayulu protested the results, stating that he is the rightful winner and that President Tshisekedi’s victory was the result of an agreement between him and now former-President Joseph Kabila so that the latter can maintain his influence over the Congolese government. Fayulu appealed against the election’s results, claiming that they were rigged, while the influential Catholic Church in the DRC stated that its own electoral observers made it clear that Tshisekedi was not the winner. There were also protests against President Tshisekedi’s victory, though not as widespread and violent as in previous years. In any case, the protests, accusations, and allegations did not stop the swear-in ceremony, and President Tshisekedi is now in control of the massive and resource-rich African nation. What Should Washington Do Now? A US State Department press release published on January 23 congratulated President Tshisekedi’s victory, saluting a peaceful and democratic transfer of power and even congratulated former-President Kabila for ceding power. Nevertheless, there was a small caveat to the statement, as the communiqué encouraged “the government to include a broad representation of Congo’s political stakeholders and to address reports of electoral irregularities.” This sentence can be regarded as a continuation of a January 16 press release, which declared that “the United States will hold accountable those who perpetrate election violence or undermine democratic processes.” It goes without saying that the government has little interest to review the results of the elections. With President Tshisekedi now in power, the question is what will Washington’s policy be toward the new regime. Trade between the two countries is quite limited: according to the US Office of the Trade Representative, US goods exports to the DRC in 2017 were $76 million, while US goods imports from the country totaled $86 million. Foreign direct investment is similarly low, at around $76 million. The real problem was that the lengthy Kabila regime was well known for its corrupt practices. This prompted the US Department of the Treasury and its Office of Foreign Assets Control (OFAC) to impose sanctions on various Congolese individuals, ranging from policymakers to senior security officers. Of course, these sanctions did not deter the Kabila regime from staying in power for over a decade and a half. Thus, the election of a new president gives Washington and Kinshasa an opportunity to restart. The Congolese leader has promised to release all political prisoners, which would be a positive first step at improving relations. Also important is that any cabinet members in the Tshisekedi administration are not under OFAC sanctions. Experts on the DRC whom the author interviewed highlighted that they are hopeful Washington will get along well with the new government, particularly as the new president is from the opposition and was not the Kabila-supported candidate. While this is true, we will have to see how President Tshisekedi deals with the former regime, particularly as Kabila’s Common Front for Congo (FCC) coalition has a parliamentary majority, meaning the next prime minister will come from the pro-Kabila coalition, as AfricaNews explains. The Democratic Republic of Congo is a complicated country, not just because of the recent elections but also due to the nation’s other challenges, such as violence in the eastern provinces and a deadly outbreak of Ebola, not to mention the ever-present poverty and corruption. After delayed and controversial elections and a less than ideal inauguration ceremony, there is a head of state in the DRC whose last name is not Kabila. This is a historic milestone in itself. The international community, in particular the US government, which has placed many sanctions on Congolese officials, will be closely monitoring whether this change of the guard in the African nation is anything to be hopeful about. Wilder Alejandro Sanchez is an analyst who focuses on geopolitical, military. and cybersecurity issues. @W_Alex_Sanchez. The views expressed in this article are those of the author alone and do not necessarily reflect those of any institutions with which the author is associated. 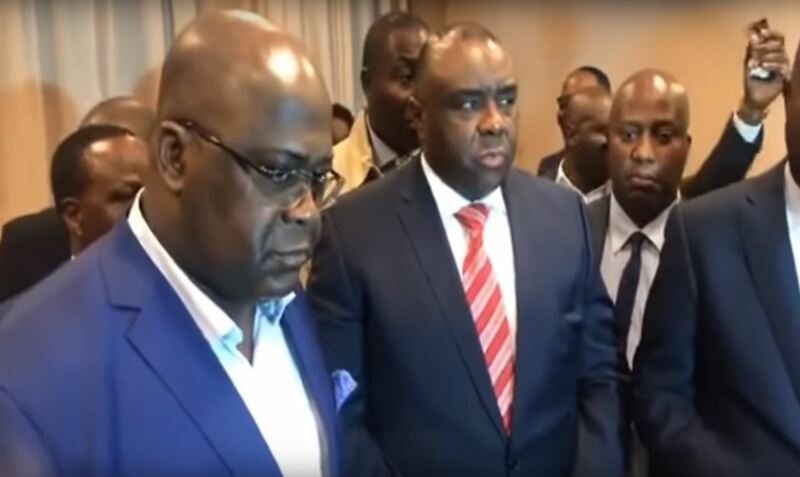 Photo Credit: Félix Tshisekedi, in a blue coat on the left, on September 12, 2018. Screenshot of YouTube video.